Armed forces division consists of 3 uniformed forces are Army, Navy and Air force. 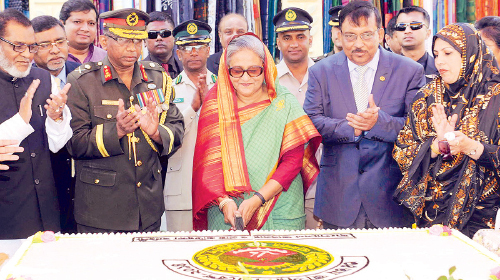 Armed forces division is an extension of Bangladesh Prime Minister Office for issuing approval for Armed Forces deployment & coordination between Army, Navy and Air force headquarters. Armed force division is the main Government organ for the coordination of all operational matters and important administrative matters relating to Army, Navy and Air force. The main duty of Army to save Bangladesh from any foreign attack. During political crises Army helps Government to handle unrest and work until return stability in the country. Navy was formed on July 1971 to fight against Pakistan force during Intendance of Bangladesh. Bangladesh Biman Bahini or Air force is a branch of air of Bangladesh Armed forces. The Air force was formed on September 21, 1971. In the beginning Bangladesh Air force participated in the Independence war of Bangladesh against Pakistan with 3 out of date aircrafts which were given by India. Elite force RAB formed to recover illegal arms, arrest criminals, assist other law enforce agency, patrol duty and save public life and assets. Ansar Bahini formed on February 12, 1948 with officer and abolished Hour Guard to Ansar Bahini. Ansar Bahini took part in the Liberation war of Bangladesh in 1971. In 1998 Ansar-VDP awarded National Standard by the Government. Ansar Battalions are deployed with police and RAB. Ansar VDP are working in different important organizations like Airports, Sea Ports, Land Ports, Public Transport, Power Stations, Banks, Agriculture firms, government offices, traffic control, etc. Ansar VDP has male and female members who have significant achievements in sports, cultural and social activities. Ansar maintaining 27 picnic spots located Gazipur-Kaliakoir highway about 50 km from Dhaka where any organization or general people can enjoy with their family and relatives.